The employment data is closely watched by financial markets; although the data isn’t necessarily a leading indicator for the economy, it is probably the most important from a political and social perspective. Weak employment data is a worry for political incumbents and concerning to policymakers. However, beyond the headline data, there are usually interesting trends worth noting. In this week’s report, we will examine two trends that have longer term implications. Career paths were part of corporate culture three decades ago. Large companies often had junior executive programs, where promising young talent was brought to the firm and would follow a rotation of positions in numerous departments before finding a permanent home. In other situations, college graduates would join a company and follow a path of positions of increasing responsibility. However, over the years, outsourcing jobs overseas and increasing industry concentration have probably reduced the number of entry level professional positions in the U.S. 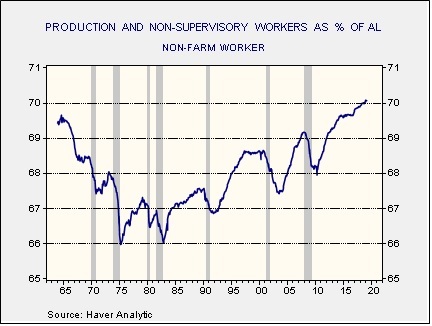 This chart shows the percentage of production and non-supervisory workers compared to total non-farm employment. In the 1970s, this percentage declined to a low of 66%. However, since the early 1980s, the percentage has steadily increased in each business cycle. This data suggests that an increasing number of jobs are non-management positions. We suspect that college graduates are being forced to accept non-management positions as fewer of them are available for an increasing number of graduates. Such disappointment has the potential to cause social unrest. At the same time, reversing industry concentration would tend to boost the number of management jobs in the economy (every firm needs HR, finance, etc.). Thus, support for anti-trust actions could become more popular. Second, initial claims, on a weekly basis, fell to 40-year lows recently. However, the weekly data is “noisy” and can be affected by floating holidays and weather. 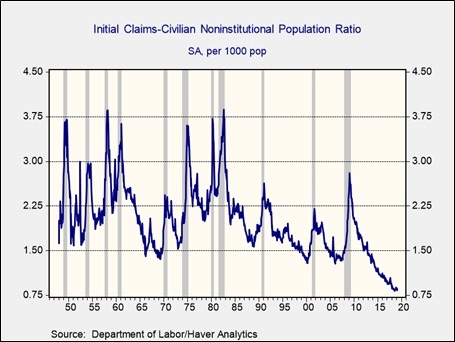 Another way of looking at claims is to scale to the civilian non-institutional population. This data is at historic lows. This low level of claims is likely due, in part, to firms holding on to workers because of tight labor conditions. A rising number of retirees will lift the non-working civilian non-institutional population but fewer workers will tend to depress claims. In any case, this level of claims compared to the population is remarkably low and would argue that wages should rise. Overall, these two charts offer insights into longer term issues in the labor market. They won’t have an immediate effect on financial markets, but both signal potential for further disruption.